Someone did not sprawl well this time. It does not matter if you call them fainting, fainter, faint, nervous, stiff-legged, myotonic, wooden-legged or Tennes﻿see scare g﻿oats. The fact remains that they are unique and fun. Why? Because, when startled, their muscles contract and they usually fall over frozen for a few seconds. Despite this rather unusual, albeit-harmless genetic condition, fainting goats are easy to care for and make quite popular pets. They originally came from Nova Scotia but were first recorded in history, from Marshall County, TN, back in the 1880s. These goat breeds were almost extinct by the 1980s but are now thriving throughout the world. Marshall County, Tennessee is named the “cradle” of the Myotonic goat. When Myotonia, (stiffening of the muscles), sets in they may not, completely, lose their balance and fall over. The older animals learn to "sprawl" in MMA terms in order to keep from falling over so much when they know they start to stiffen up. When placed in extreme stress or fear, their epinephrine and cortisol, (fight or flight hormones), cause increased muscle tension. Myotonia helps build more muscle! They have a sturdy framework & bold face expressions. They do not lose consciousness, but their muscles just tighten up and many times they lose their ballance and fall over. This startled condition only lasts a few seconds, then they are up and running again! 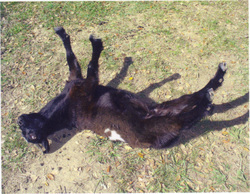 Keep in mind that just because a goat faints does not mean it is a "Tennessee fainting goat". Slightly smaller than standard breeds of goat, fainting goats are generally 17 to 25 inches tall and can weigh anywhere from 50 to 170 lb. They have large, prominent eyes in high sockets. Their hair can be short or long, with certain individuals producing a great deal of cashmere during colder months. Common coat colors are black and white; however, many possible coat colors are found in this breed. Their life expectancy is 12 to 15 years. 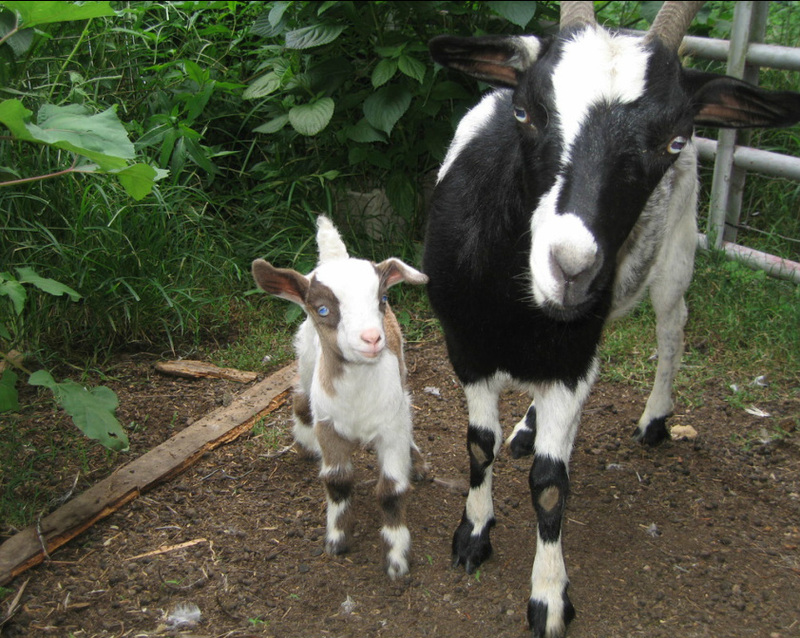 Their smaller size means that they are somewhat easier to care for and maintain than larger goat breeds, which makes the fainting goat desirable for smaller farms. They are also raised as pet or show animals as they can be friendly, intelligent, easy to keep, and amusing. The size is not the only factor in them being easy keepers. The myotonia prevents them from challenging fencing as well as keeps them from climbing and jumping on things others are able to. We allow ours to have the run of the yard, and as long as we have baby gates on the steps they are unable to climb up on the two foot high porch. Being a landrace breed, they are not as prone to internal parasites, as other goats might be when kept in the same area. This breed is listed as threatened by the American Livestock Breeds Conservancy so the fainting goat is not used as often for chevron/mutton/cabrito as other meat goat breeds; its rarity makes the live goat more valuable. Yes, there are some who breed the larger Tennessee Meat Goat, but we breed the smaller animals for pets, and to show. Everyone who has tried it, has loved the milk they produce. I have found after trying the milk of a few other breeds that fainting goat milk is one of the creamiest if not THE creamiest I have had yet. There is no off taste whatsoever. The only reason you do not hear more about their milk is because people are not trying it as they are known for the meat instead. I know what your thinking..."they are small, so they can not produce much". Well, as with every breed there are some animals who give more and some who give less. I have one doe who gives as much as the Nigerian Dwarf which we tried out before realizing we only wanted fainters after coming out one morning to find her on the hood of my truck.